Sunday was really fun and crazy but also a very powerful day. 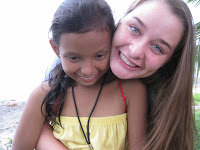 One of my favorite moments was after swimming I hung out with some nica chicos. We were having so much fun giggling, practicing English, and taking endless pictures and videos with my camera. It was such an awesome connection. I could be in the moment forever. Sunday was also powerful because we presented the Gospel and how the kiddos could become part of God’s family. After we finished for the night we asked if anyone wanted to stay and talk. A group of girls were in the corner crying. No female translators were available, so knowing the little Spanish that I do I went to try and talk with them. God showed up in huge ways . A couple other girls on our team came over and prayed over the girls in English. Then each of the girls prayed for themselves in Spanish. I ended by praying for them in Spanish, saying, “God, thank you for accepting these girls into your family and for dying for them. Thank you for the gifts that you’ve given us through salvation, like peace and eternal joy. Bless these girls. Amen.” It was incredible seeing the girls so overcome by God’s power. They also said they were crying because we meant so much to them and they were sad to see us leave. We told them that we’d see each other again because God’s family will always be together in Heaven. Hermanas en Cristo para siempre! Another day that meant a lot to me was Tuesday. Early that morning I sent the team off for a day of construction while I waited for Lila, a Nicaraguan artist that Masterpieces for Miskitos is collaborating with. She arrived at the compound about midmorning. She showed me some of her art and I showed her around the compound. We went up to the third floor, prayed, and discussed some ideas for the paintings. God really inspired us with his beautiful Nicaraguan landscapes and nature. We’ve decided to use that as the inspiration. God was prevalent throughout the day. He really showed me that He has big plans for this ministry and that He has brought Lila to us. I am so excited to see how God is going to use her and also touch lives in the process. Being in this place, surrounded by so many people who are loving and serving God, with no distractions, and seeing God work so clearly; it’s an amazing place to be. Hey mom and dad, I wouldn’t come home if you’d let me (haha just kidding. Kind of) Love you! All is good here. Obviously.